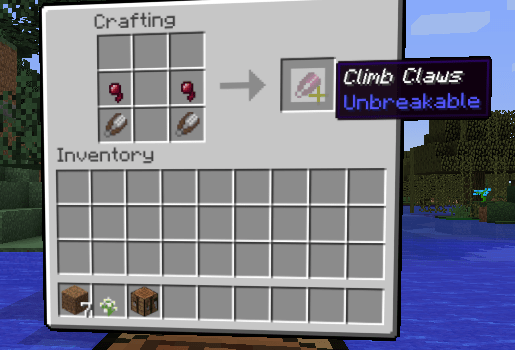 ClimbeyMotion is a totally-optional way of moving about the Minecraft world by jumping and climbing. Inspired by Climbey. 1.10+ only. Instead of settings, climbeymotion requires crafting and equipping certain items. These items have to be crafted and do not show up on the Creative Inventory. You should also set your movement to Free Move and we recommend Run-in-Place style for the authentic experience. 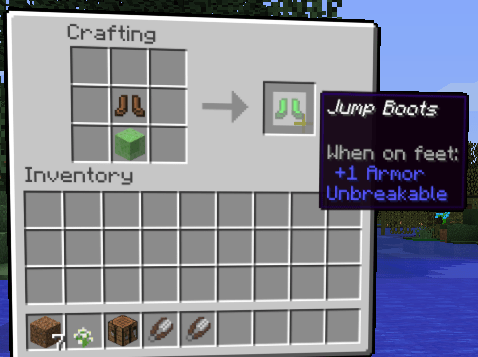 Requires wearing the Jump Boots, which can be crafted with leather boots and a slime block. Only works on the ground in Free Move mode and with Realistic Jumping turned on. Raise arms, hold button, swing arms down and release button, try not to kill yourself. Fall damage has not been removed or changed at all. Use creative mode if you’re scurred. The controllers will rumble while winding up to jump. Leaping potions multiply the speed. Be Careful. Requires wearing the Climb Claws in one hand or the other. These can be crafted with 2 shears and 2 spider eyes. Hold button on respective controller, touch anything collidable to climb. To pull yourself up: hold the top edge of the highest block and pull yourself at least halfway up, you will pop up the rest of the way. If you are on the ground, you can only use the Attack button to start climbing. In the air or already climbing you can use either. This prevents ‘sticking’ when brushing up against a wall while moving. You cannot click-mine blocks while using the claws. You can click-attack mobs tho. You cannot roomscale mine unless you are holding a tool and not holding the climb button on that controller. If you find you still accidentally break blocks, turn Weapon Collision off. The interactive hotbar is disabled while climbing. Do not open the inventory or game menu while climbing, you will fall. Run-in-place freemove is recommended as you tend to hold the Move Forward button down too long and run off the cliff you just climbed up. Requires wearing the Climb Claws and the Jump Boots! While holding onto a wall, press the Jump button. You do not need to hold it down. The controller holding the wall will vibrate indicating you are in wall-jump mode. Swing and release with that controller and you will be launched in that general direction. Has less power than 2-handed jumps from the ground.To cancel wall-jump mode, grab the wall with the other controller. Admins ensure you are using the latest Vivecraft Spigot Extensions or none of this will work. Set climbey.enabled in the config.yml to allow use of climbey items. Default is false. You can configure which blocks can or cannot be climbed in the config.yml. See the config-instructions.yml file for exact details. The idea is you can either whitelist certain blocks for climb courses, or blacklist certain blocks to allow climbing everywhere and still make some unclimbable obstacles.